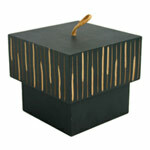 The wood artisans hand-craft this lidded box by hand. 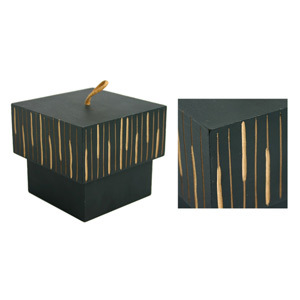 They carve vertical lines on the sides of the lid and place a bamboo handle on top. This practical piece will lend an exceptional touch to any tabletop. Size: 13.5 cm W x 12.0 cm H x 13.5 cm D.